Last night Tim and I went out to dinner. We usually go out to dinner on Saturday anyway, so it wasn’t really a Valentine’s Day celebration. I had some delicious blackberry sangria, pasta with chicken and mushrooms, and we split a slice of chocolate cake. It was a nice night together! Until this morning. 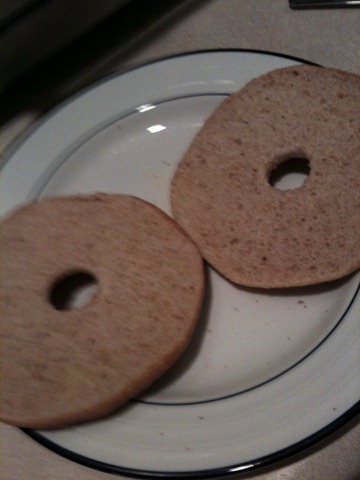 I got up and had an English muffin with PB and coffee, and immediately, my stomach started disagreeing with my decision. Suffice it to say, it was not pretty 10 minutes later. I felt better, so I decided to go ahead as planned and try to go shopping to get some of the things I need for the wedding: a rehearsal dress, a shower dress, and clothes for my bachelorette parties. Unfortunately, no stores have dresses that are anything close to what I want yet. I couldn’t find ANYTHING, and I went to two different malls. I did wind up with some cute shirts for work, though. 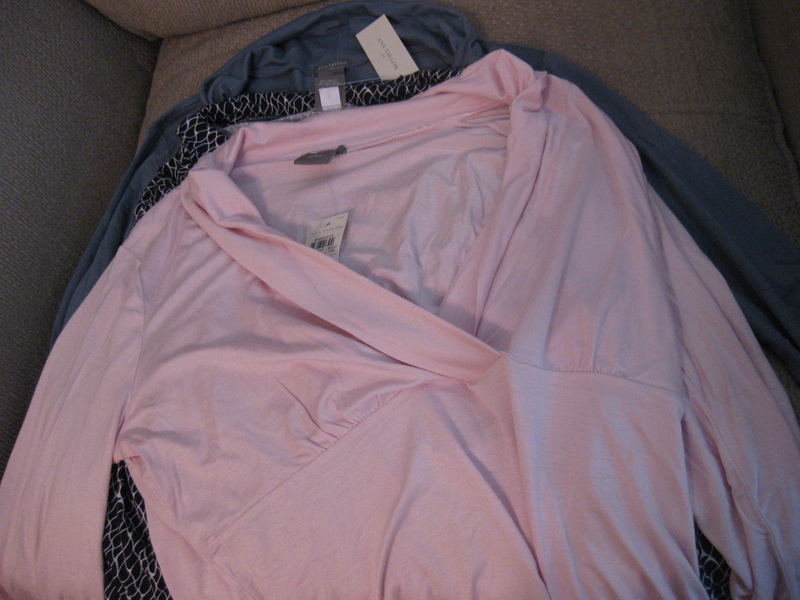 And I also got two bras, which I desperately needed. But you don’t get to see those. Also, pet peeve: when women bring their husbands/fiances/boyfriends to Victoria’s Secret. There were no fewer than four men awkwardly lurking around VS while I shopped for bras. Creepy. Anyway, my stomach was crampy and upset all day while I shopped. 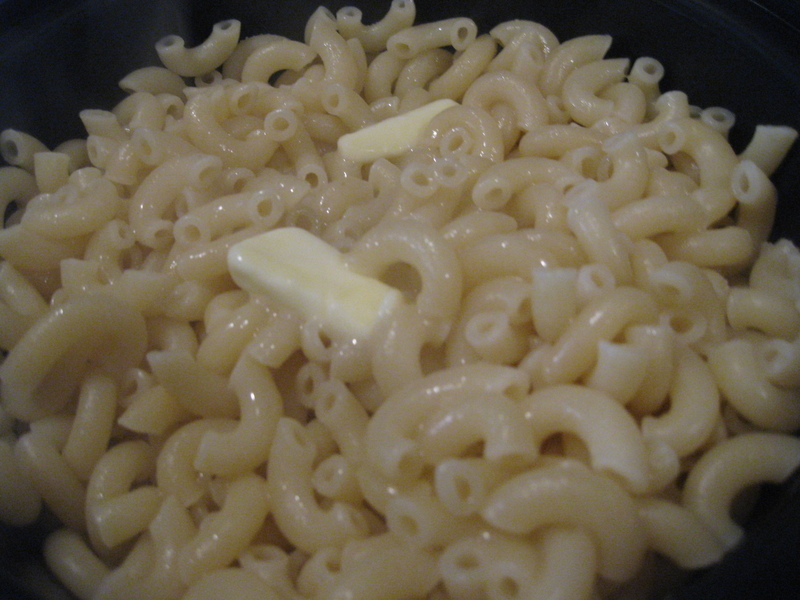 I got home at about 1 o’clock and made the only thing that sounded remotely appealing: plain macaroni noodles with a little butter. Yeah, that didn’t take well either. 10 minutes later…you get the idea. This is all extremely weird, because I have a cast iron stomach. It rarely gets upset. But today…ugggh. Anyway, again, I felt a little better and decided to finish running my errands. I went to Target to pick up the printed pictures of Milhouse and get a few grocery staples, and then to Michael’s to get more adhesive and vellum for wedding-y stuff. 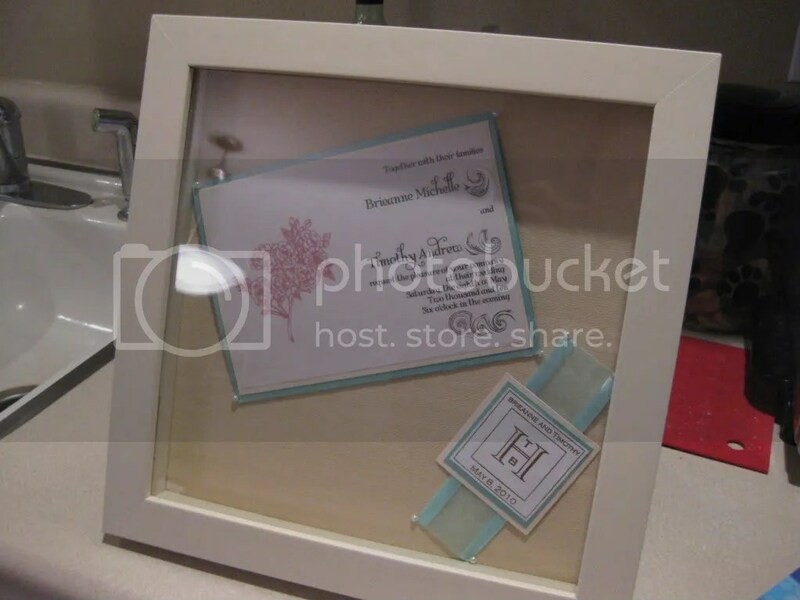 I noticed shadow boxes were 40% off, and I’ve been meaning to get one for our invitation, so I did. I might dry a few flowers from my bouquet to add after the wedding, but I like it! I just need to figure out where to hang it. I also picked up dinner for myself at Target and told Tim to fend for himself. 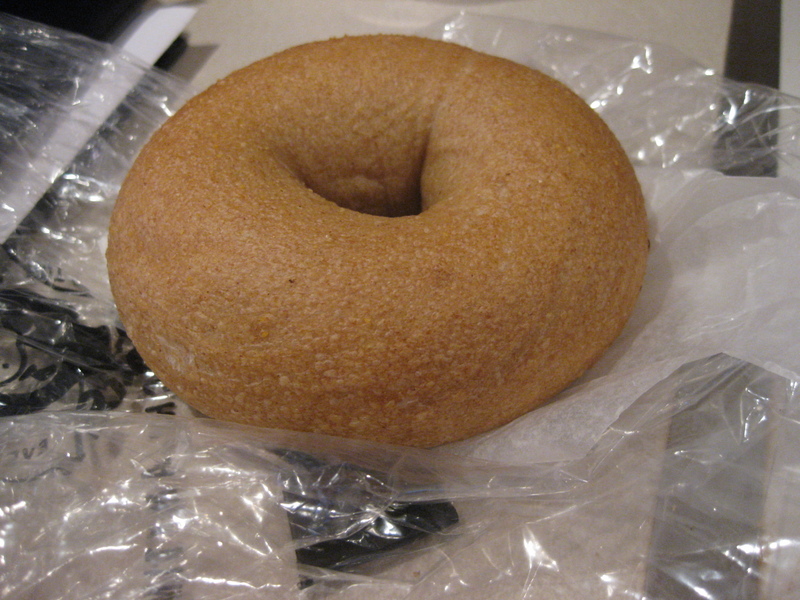 A plain wheat bagel. Exciting! So, that’s our romantic Valentine’s Day. I’m currently sitting in my armchair fighting nausea and wishing it would go away. Blech! I’m glad I took tomorrow off. At least I was productive. I’m not sure if it’s food poisoning, or a stomach bug, or what, but it’s not pleasant! What’s your nausea remedy of choice? So, this is a secret, treasured family recipe. And I’m sharing it with you. You should be honored, and then immediately proceed to your kitchen to make this. My mother makes a double batch of this every year the day after Thanksgiving, and my whole extended family has a big pasta dinner after a tough day at the Black Friday sales. 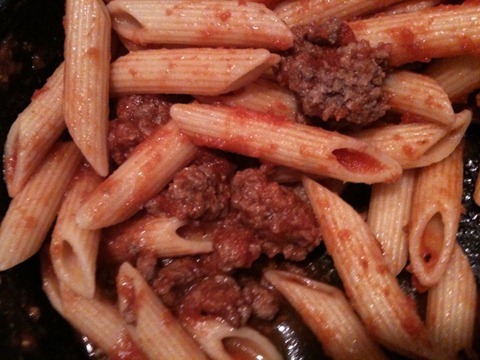 It is incredible, and I’m pretty sure it’s also incredibly healthy–lots of veggies, and you can use very lean beef or ground turkey, and far less sodium than store-bought spaghetti sauce. And my mom’s instructions: put tomato puree, water, tomato paste, mushrooms and spices in a pot. Brown ground beef in a pan adding 1 teaspoon salt and 1/2 teaspoon pepper per pound(this is in addition to the salt and pepper you put in your tomato puree and water). Drain and add to the tomato puree and water mixture. Saute onion, green pepper and garlic. (Brie note: we leave out the green pepper because we don’t like it.) I add a little water so it doesn’t stick. You can either add a little water and then drain it and add to your sauce OR you can use a couple of ounces from the 21 and then you don’t have to bother draining it. I usually taste it after everything is put together because the salt and sugar is crucial to the flavor. You may have to add a little more salt and/or sugar to get the flavor just right. This stuff is seriously good. It spoils me. I don’t want to eat pasta sauce from a jar after this. Make it. Trust me. In other news, tomorrow I’m going to my new gym for the first time. I’m excited. 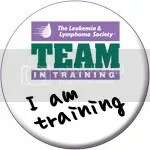 Also, (holy crap) I’m running an 8K in a week. I don’t feel prepared at all, but I think it’s just my body being silly after a rest week. I’ll be fine!